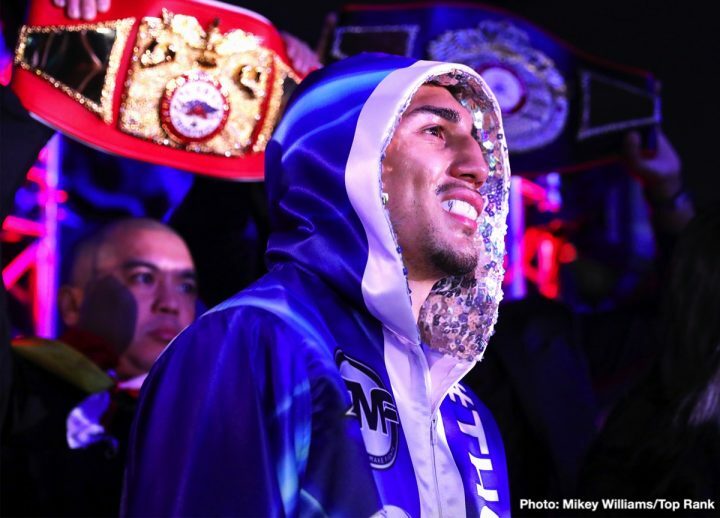 By Aragon Garcia: As many expected, Teofimo Lopez (12-0, 10 KOs) crushed Diego Magdaleno (31-3, 13 KOs) last weekend by an easy 7th round knockout on ESPN+ in Frisco, Texas. Lopez revealed afterwards that he plans on fighting on April 20th on the undercard of the Terence Crawford vs. Amir Khan card on ESPN PPV at Madison Square Garden in New York. Lopez, 21, says former two division world champion Jose Pedraza (25-2, 12 KOs) doesn’t want the fight against him. That has to be seen as the highest form of respect on Pedraza’s part, because he would get a lot of attention from the boxing world if he accepted Lopez’s challenge to face him on the April 20th card. Lopez says he’s going to continue with his “takeover” of lightweight division by beating the best that he can face. Lopez says he’s hearing that World Boxing Council lightweight champion Mikey Garcia (39-0, 30 KOs) won’t be returning to the 135 lb division to defend his title. Lopez says he wants to fight for the vacant WBC title once the belt is vacated by the 31-year-old Mikey. Whether the WBC will let Lopez fight for the vacant WBC title is unknown at this time. “As I’ve always said, I’m going to steal the show,” said Lopez to ESPN Deportes about him intending on taking the limelight away from the main event fight between terence Crawford and Amir Khan on April 20 on the MSG card in New York. “We do not know which rival will be, but I’m sure they’ll put a strong one in. They said José Pedraza, but apparently they do not want it. I’ll see who they’re playing,” Lopez said. Lomachenko isn’t chomping at the bit to fight Lopez either. Lopez says he wants the fight with Lomachenko, but he’s not going to wait for him. He’s going to move up to light welterweight in 2020, and go after the guys up there. Pedraza, 29, lost his last fight against Vasyl Lomachenko last December by a 12 round unanimous decision. If it’s true that Pedraza doesn’t wish to fight the young knockout artist Lopez, you could understand why he wouldn’t want to. Losing to Lomachenko is bad enough, but then to have to face a devastating puncher like Lopez in his next fight. It’s probably too much for someone like Pedraza. It would be like Pedraza fighting Gervonta ‘Tank’ Davis again. Pedraza was blown put by Gervonta in seven rounds in 2017. “I’m hearing that Mikey Garcia is not going to return to 135 pounds. I’m willing to fight for the WBC title, and if everything goes well, we could do with Lomachenko the unification, it would be a great fight,” Lopez said. You have to suspect that at least two of those contenders will agree to fight for the WBC lightweight crown if it comes vacant. That mean Lopez is probably not going to get a shot at the WBC belt. Lopez took a lot of flak from some boxing fans for taunting Magdaleno after he knocked him out in the 7th round. Lopez walked up on Magdaleno while he was still down and made a swinging motion with his hands. Lopez said the reason why he did that is because Magdaleno had made comments about Honduras, and that upset him. Lopez says he has family in Honduras. Lopez says he felt disrespected.